Georges (Jean-Louis Trintignant) and Anne (Emmanuelle Riva) are an elderly couple living in Paris. Despite their advancing years, they remain active, go out and their enjoy lives, and also enjoy each others' company. There lives are irrevocably changed when Anne suddenly starts acting unresponsive one morning at the breakfast table. She has suffered a minor stroke, one which inexorably leads to a sudden, rapid decline that sees her confined to a wheelchair and in constant need of care. Knowing that his wife is afraid of going to a hospital, and horrified at the thought of sending her to a hospice, Georges agrees to care for her himself. As Anne gradually gets worse, losing the ability to control her basic motor functions or even speak coherently, Georges is confronted with what it truly means to love someone. 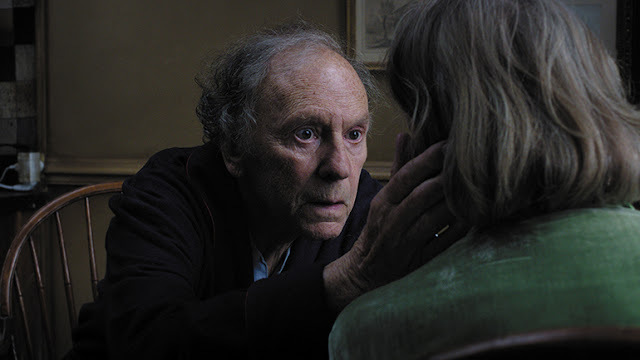 Despite being concerned with the inevitable decay that awaits anyone (un)lucky enough not to die young and healthy, Amour is easily Michael Haneke's most accessible and empathetic film to date. Ever since his startlingly bleak debut The Seventh Continent, a harrowing and meticulous depiction of a middle-class family destroying itself, Haneke has acquired a reputation - rightly or wrongly - as a director who delights in punishing his characters - and, by extension, his audience - by forcing them to endure physical or emotional traumas before his silent, unforgiving camera. Whilst those aspects of his work still pervade Amour, it's also a carefully observed, finely wrought examination of two people facing their last days together and trying to figure out exactly what that means. The characters of Georges and Anne feel like real people, rather than ciphers advancing an intellectual argument. It would be a mistake to think that Haneke has turned into James L. Brooks all of a sudden, though. Whilst there may be more of a pulsing heart at its centre, Amour remains as severe and unrelenting as his earlier films, it's just that the subject matter is a little more fragile. The opening scene of the film leaves no possible doubt as to the outcome, and it is a sad and painful one. The story is about seeing how Anne and Georges reach that point, and in doing so it depicts Anne's gradual decline from a lively, vivacious woman to someone who is half-paralyzed and completely helpless with Haneke's typically stark, unremitting focus, taking in every stage of her irreversible spiral. Haneke's cinema might best be summed up as leaving the camera running longer than might be considered comfortable, showing every stage of a process in grim, exacting detail. On the face of it, Amour is such an unromantic film that the title might seem to be ironic, in much the same way he made a film about the love audiences have for violence and brutality and gave it the flippant title of Funny Games. This, too, would be a mistake, since there is nothing but sincerity behind that title. Much as he used the story of The White Ribbon to explore different ways in which the seeds of Nazism might have been planted in the early 1900s, Haneke takes the word "love" and offers different definitions of it through the prism of his central relationship. Their interactions prior to Anne's stroke are shown to be affectionate but comfortable, as would be expected from a couple who have been together for literally decades. They are also irritable, even cruel to each other, as seen by Georges' reaction to Anne's first episode: when she acts normally after a few minutes of staring into space, he angrily snaps at her and asks if she is playing a joke on him. She, in turn, is confused by his reaction and becomes angry as well. This sets the tone for their interactions throughout the film, which veer between heartbreaking devotion and a resigned sense of duty on Georges' part. Anne meanwhile moves between fearing and welcoming death as she deteriorates, though there is never any clear sense that she is progressing from one to the other, instead constantly wavering between the two. It's a remarkably complex and nuanced relationship that ably realises the different facets of a couple coming to terms with their mortality and imminent separation. Much of the credit for that relationship must go to Jean-Louis Trintignant and Emmanuelle Riva. With the exception of the opening scene, which takes place at a concert performance by a former student of Anne's, the entirety of the film takes place within the confines of Anne and Georges' apartment. Though there are a handful of characters who intrude upon their isolation - most notably Isabelle Huppert as their daughter, whose desire to grieve comes into conflict with her parents' insistence on not discussing Anne's condition wherever possible - much of the film consists of just the two of them talking to each other, or increasingly, only one of them talking to the other. It's essentially a chamber piece about the limits of devotion and it would be nowhere near as compelling as it is without such strong performers at its heart. Emmanuelle Riva has been rightly acclaimed for her work: her depiction of Anne's worsening condition is like watching a sand sculpture slowly being eroded by the sea. It's slow, inevitable, and tragic, and she conveys each stage with only the slightest physical change. Yet Trintignant is equally as great since the film gets much of its power from his reactions to Riva, and in the way in which he suppresses Georges' emotions without completely hiding his fear of being left alone. It's easy to single out Riva for praise since she is the one who has to wither in front of our eyes, but it would be far less impressive without Trintignant there to watch it happen, then try his best to make the situation as tolerable as possible. There's much to admire in Amour, but it lacks a certain coherence that would make it a truly great film. Every single scene is immaculately crafted, and at the heart of nearly every frame is at least one great performance, but it's also gruelling and episodic to a fault. It's an accumulation of stunning moments which screeches to a halt every time a new scene begins. It's somewhat asthmatic in that regards: running smoothly for a few minutes then gasping for air the next. Crucially, despite being a human story from a film-maker who can be very arch, it suffers from being a work of drama from someone who has always been better when making intellectual statements in the shape of narrative films. He's a master when it comes to stimulating minds, but not when it comes to plucking heartstrings.